Today is the 77th anniversary of the founding of the Sword of the Lord newspaper in Dallas, Texas in 1934. The Sword, founded by my granddad, John R. Rice, became the most influential fundamentalist publication of the twentieth century. 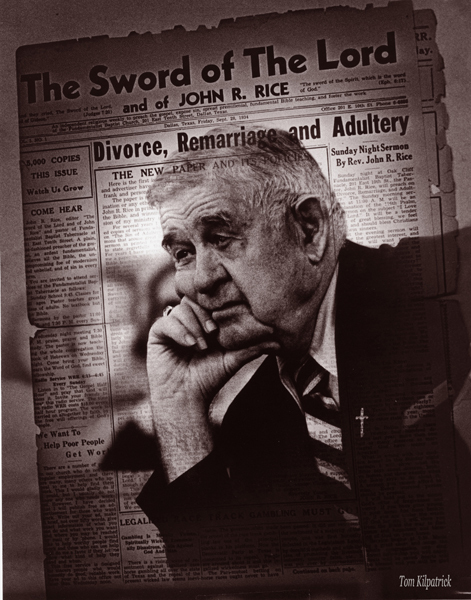 In addition to editing the Sword until his death in 1980, John R. Rice preached thousands of sermons, wrote scores of books, and mentored hundreds of younger preachers such as Jerry Falwell and Billy Graham. Granddad went at his task with single-mindedness, discipline, certainty of results, and a conviction that he was divinely blessed. He brooked no opposition. He seldom entertained or expressed any doubts about his course. I was the first of his grandsons. I was his first male descendant, and the third eldest of all his grandchildren. Early in my life, I felt a powerful expectation from my grandmother, my parents, and other relatives that I would follow in his footsteps and inherit his mantle of ministry, his passion for preaching and for soul winning. As I became a teenager and started having notions of my own, I inevitably came into conflict with my grandfather's notions of right and wrong, of morality and mission. There were two problems, really. First, more than anyone else in our family, more perhaps than any of his daughters--my aunts and my mother--and more than any of my cousins or siblings, I inherited some of my grandfather's strongest personal characteristics. I had an innate and overweening self-confidence. I was perfectly certain that when I expressed an opinion it was the right one. If you disagreed with me it was probably because I needed to explain a little more to you, or you hadn't yet thought things through, or you needed to get some clarity or do some studying or pray about it to let my God set you straight. Second, Granddad presented his way of looking at things as a package. I knew that I was expected to agree with each judgment or opinion he expressed, from the proper length of my hair to the correct interpretation of any single verse in the Bible. I was expected to agree with him about the need to resist the desegregation of schools and other public institutions in the South. I was expected to support the war in Vietnam as a holy crusade against communism. I was expected to disapprove--with him--of the public company that Billy Graham kept with those whom my grandfather termed liberals or modernists. I don't remember any doubt Granddad ever expressed, at least in my presence, or any need to get anybody else's point of view--other than God's--before he made a decision. But as a teenager in the early 60s, I began to have my own doubts. First about various small matters, and then about larger ones. I began to interrogate my ideological and theological inheritance. When two black children tried to integrate my 8th-grade classroom and were met with a hate-filled mob of my fellow students, I began to perceive that black people in my small southern town of Millington, Tennessee were victims of a cruel and historic racial injustice. Then I began to question everything else I had been taught about history or politics or minor details of daily life. I suspected that Martin Luther King, Jr. might not truly be an agent of communism and an evil troublemaker and infidel, after all. I wondered whether a deck of fifty-two playing cards was truly an excrescence of evil. I questioned whether the Bible was inerrant because it had been literally dictated by God. I began to ask whether women should be allowed to cut their hair or wear pants rather than skirts. I wondered whether going to a theater to watch a movie was truly a sin against God as I had been taught. I asked whether going to a high school dance would deliver me into the hands of the Devil. When I came home from high school each afternoon to watch as CBS's Walter Cronkite reported on yet another day's casualties in Vietnam--10 or 20 more US soldiers killed in yet another ambush, another hundred or more Vietcong soldiers or civilian sympathizers killed in yet another US airstrike--I started to question all of my grandfather's theological, and political assumptions. Soon I determined that the war in Vietnam was immoral, a criminal enterprise, and a genocidal abomination, and that I was obligated to protest the war. By the time I was 17, I could no longer believe in my grandfather's God, and I had become my grandfather's self-righteous critic. I suddenly found that I was bound by no constraints whatsoever. I could begin to seriously regard the thoughts of Sartre and Lincoln, Baruch Spinoza and Germaine Greer, Malcolm X and Karl Marx, Joseph Conrad and Joseph Heller. I entertained the illusion that I was free of my grandfather altogether - free of his religion, free of his politics, free of his culture, free of his belief in God, and free, almost, of my family. Decades later, paradoxically, it was my grandfather's compassion that has drawn me back to a more generous reconsideration of him. As a child, I remember when I was privileged to stay overnight with my grandparents and then to get up and have breakfast with Granddad and Gram early in the morning. After breakfast we had family devotions. Every morning, he prayed that God would bless, keep and protect scores of people, naming them by name, praying for them individually and in detail. He prayed for preachers and missionaries, friends and family members scattered across the world. As he prayed he wept tears of joy and sorrow, leaving me amazed by the depth and power of his emotions. I always had a feeling that he cared for us as individuals because we were an expression of his love for the whole world, rather than the other way around. He was most interested in finding new souls to win, new targets to reach. He was always interested in selling another ten thousand subscriptions to the Sword of the Lord, printing another million copies of his Bible tract What Must I Do to be Saved? in yet another language, opening yet another letter from someone thanking him for a sermon he'd printed in the Sword and reporting that they had just gotten saved and were now headed for heaven. He kept careful track of the number of souls he had won to Jesus, the number of letters he'd received from people who said they'd gotten saved while reading a copy of the Sword of the Lord or one of his Bible tracts--28,250 such letters between 1934 and his death in 1980. The statistics mattered a great deal to him as an index of how he was doing with his mission of saving the world. My grandfather's religion was no academic religion, no intellectual exercise in theology or disputation--though he was a theologian who engaged in many polemics about dogma, faith, and belief. He was driven by a profound compassion for the masses of frail, flawed, lost human beings. His was a religion of the heart and the soul, a religion of the poor and the humble, the brokenhearted and the lost. And he was a preacher because he loved his fellow humans. As I was growing up, I heard my grandfather preach hundreds of sermons, and each of them was a string of stories--one story or parable or illustration after another. As he preached, he recited poetry, recited long passages of scripture, sang scraps of hymns, and talked to people alive and dead, from his wife sitting in the front pew to his own long-gone mother looking down on him from heaven. In every sermon, he broke into tears a half dozen times as he spoke of his passion for winning lost souls to Jesus. Over 30 years after his death, my grandfather's compassion is what links me to him. It pulls me back into communion with the man who more than anyone else shaped me into who I am. My grandfather's love for poor lost souls, his desire to find a true religion of the heart, is what gives me hope as I move beyond his narrow fundamentalism toward a larger vision of the kingdom of God.